The architectural proposal does not view the element of destruction as an experience of horror, but as motivation for monitoring and understanding the unpredictable force of the natural elements. The building is contracted to the necessary mass and rises in the form of a laboratory that studies and monitors the new park created on the site. Through this synthesis of movement, the street level allows unhindered public access and unifies it with the neighbouring, tree-studded hill, creating a wider network of green spaces throughout the city. 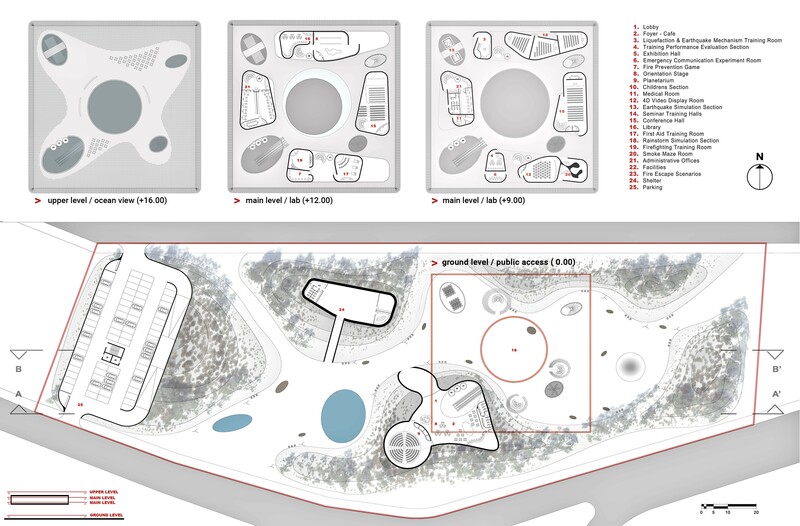 The public park connects neighbouring areas, providing an arena for existing, as well as future cultural uses, with that of the university forming the most significant one. A new topography is created as a point of destruction and rebirth. The ground is distorted, it receives the new functions of acting as a parking space, a foyer and a shelter, while simultaneously forming a natural relief that allows a view of the city and the building from higher ground and slopes. The building rises up over the disaster as a feat of advanced technology, controlling natural elements through scientific structures. Its form is conceived as a precise, rectangular prism with the central atrium as its main feature. A series of apertures in its solid mass refer to test tubes for experimentation and observation, as well as spaces for vertical communication. The tube with the seismic monitor, the wind simulator, and finally the central atrium as a rain simulator, comprise the dominant elements of the experiential interaction with the building. Similar interactive events take place within the new topography on the level of the city, and are connected to the elements of water and fire. The overall experience within the space is encapsulated in a public tour around experiments and educational events which take on the form of public exhibits. Both the building and the landscape form a broader landscape unit. The visitor experiences the space either through engagement or observation. They may actively participate in the experimental processes, or observe the natural phenomena on earth and in the sky. 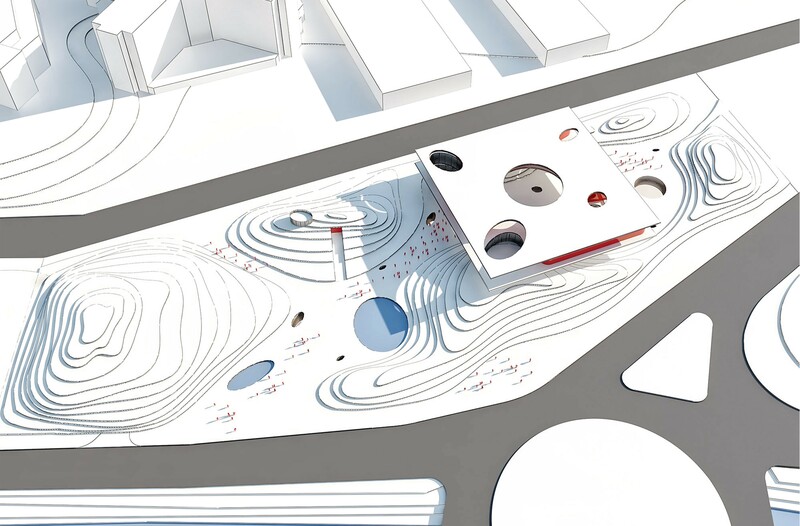 This comprises a new proposal, where the building does not function as an isolated unit, but externalizes its functions within the city, in the form of public exhibits, within a new cultural axis for the surrounding area as well as the metropolitan community.